Select Animation Controller from the Animation menu. The Frames Per Seconds slider is used both for the play speed and the when saving to GIF or AVI. 10 is a good general speed. The Play button will play the animation from the current frame to the selected last frame. The Stop Button will be enabled when playing, saving or doing a layer processes. Pressing it will stop the actions. 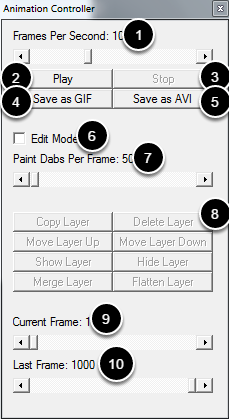 The Save as GIF will save the frames (pages) from the current frame to the selected last frame. The Save as AVI will save the frames (pages) from the current frame to the selected last frame. See the section on Time Lapsed Painting for details about setting up codecs. The Edit Mode check box controls if painting will occur across multiple pages or not. Also enabled and disables the layer buttons. Note that the edit mode will be automatically turned off it different page sizes are detected. This is done to help protect again accidentally overwriting pages not intended for animation. The Paint Dabs Per Frame slider controls how many paint dabs will appear on a frame before the next frame will receive the paint. Brushes that are dab position brushes such as those in the Pro Smoke and Gases ArtSet do not use this setting. Instead they place each new dab on a new frame. The various Layer buttons will execute the layer command on each frame from the current frame to the selected last frame. The Current Frame slider both shows the current frame (page) and also allows switching the current frame. The Last Frame slider controls the stopping point for all animation editing, playing and recording.